A wing of the US Department of Energy focused on breakthrough technologies may soon give billionaire entrepreneur Elon Musk’s most recent foray into energy storage a run for its money, the unit’s director said. Advanced Research Projects Agency-Energy, or ARPA-E, which funds projects meant to transform energy markets, has made huge strides over the last few years on next-generation batteries that could make electric cars and renewable energy cheaper and more accessible, Ellen Williams said in an interview this week. The battery division of Musk’s Tesla Motors turned a profit in the fourth quarter, after the first shipments of its rechargeable products helped to reduce losses from the company’s auto business. 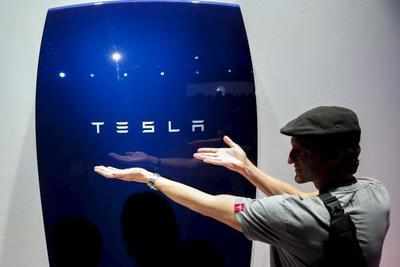 Its Powerwall batteries store energy that homes and small businesses generate with solar panels. The Powerpack model is designed for large commercial facilities. Williams said her agency has helped kickstart a dozen high-risk projects based on newer technologies that could soon outperform Tesla batteries. “What Musk has done that is creative and important is drive the learning curve. He’s decided to take an existing, pretty powerful battery technology and start producing it on a very large scale,” she said. “But it’s not technology innovation in the sense of creating new ways of doing it. We are pretty well convinced that some of our technologies have the potential to be significantly better,” Williams said. Batteries are in a “Wild West” phase, said Colin Wessells, chief executive of Alveo Energy, a San Francisco area startup developing a high power, long lifecycle battery technology for renewable energy and microgrids, or localized groupings of energy providers. Only five energy grid storage batteries have been commercialized as researchers and budding entrepreneurs race to bring new technologies to market, he noted. Wessells, whose company has ARPA-E support, said huge manufacturing advances will speed up the commercialization of battery products. ARPA-E is set to get a huge boost after the United States and 19 other countries launched Mission Innovation at the United Nations climate summit in Paris late last year. The governments pledged to double spending on clean energy research and development over the next five years. The United States will boost its overall energy research and development budget to $12.8 billion by 2021. ARPA-E was launched in 2009 with a budget of $400 million and a mandate to fund the most cutting edge technologies. President Barack Obama’s budget request for 2017 would increase its allocation to $1 billion in five years. “With that increased budget we can definitely make a difference,” said Williams. ARPA-E funds projects for three years at a time, focusing on commercializing new and exciting ideas and training researchers to pitch them in ways investors can understand. “What we do that is very different is we really set a target to get something specific done in a specific period of time,” she said. Williams said ARPA-E aims to steer projects away from what Microsoft Corp founder Bill Gates called a “valley of death” of failures between the early promise of a new energy concept and commercializing it into a viable technology that exists in the clean energy sector. Some of these miracles may come out of ARPA-E supported labs and workshops, Williams said. Besides energy storage, ARPA-E’s research projects include using robots and drones to help develop more sustainable sorghum-based biofuels, and using sensors to make heating and air conditioning systems more energy efficient. The agency has funded projects in all 50 states. “These concepts are way out-there now, but in a few years from now they may be the way things work,” she said.